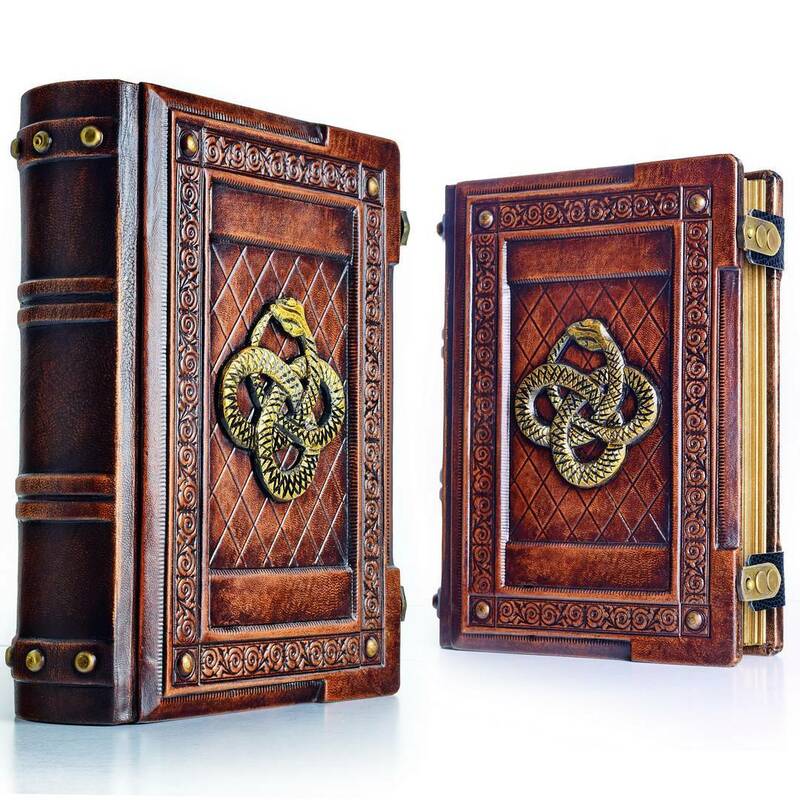 This Ouroboros-adorned tome comes to us from the talented Alex Libris. 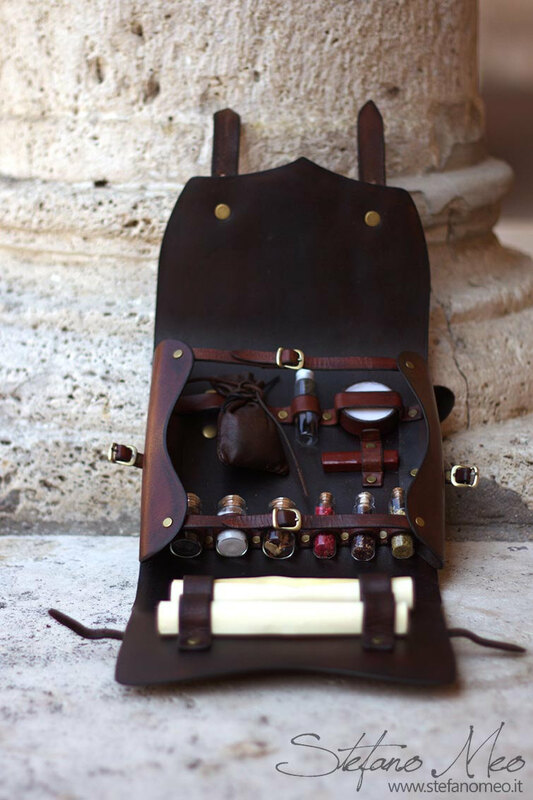 This beautiful alchemist's kit comes to us from leather crafter, and Propnomicon sponsor, Stefan Meo. 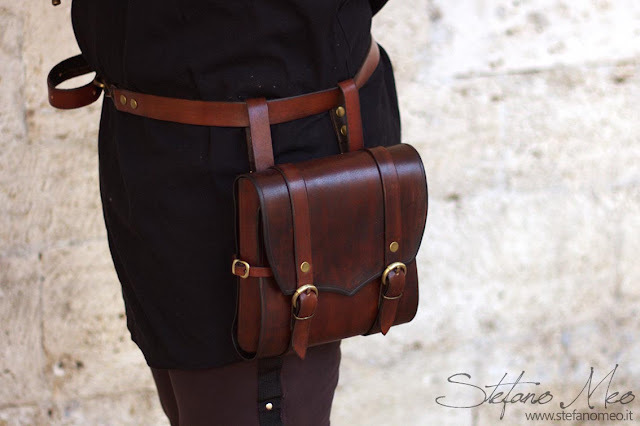 I can personally attest to the excellent craftsmanship of his work. If you happen to discover something you like in his shop you can get 10% off for the holidays by entering code "PROPNOMICON". 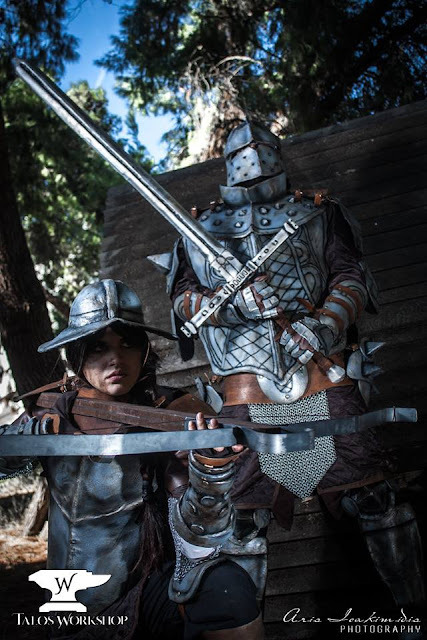 This excellent LARP tableaux is a collaboration between PlaneShifting Art, Talos Workshop, and Aris Ioakimidis Photography. 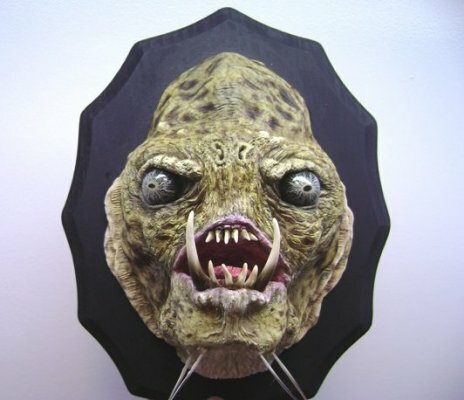 The talented Karen Main returns to our pages with this toothy creature. This cool little treasure trove comes to us from Jonnathan Haracz. 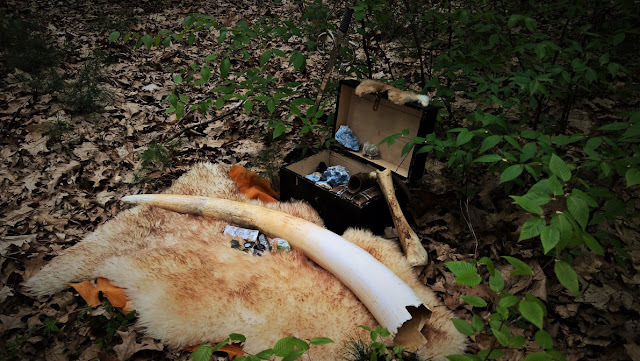 The mammoth tusk is a nice touch. It reminds me of the "not all treasure is gold coins" discussion in the original D&D Dungeon Master's Guide. 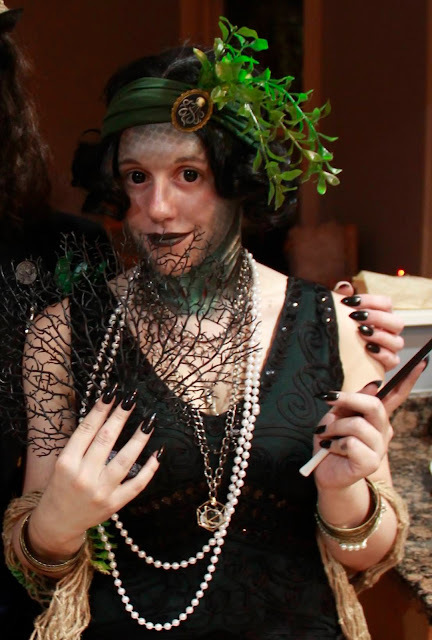 This wriggly inhabitant of the Upside Down comes to us from Brazen and Bold Productions. 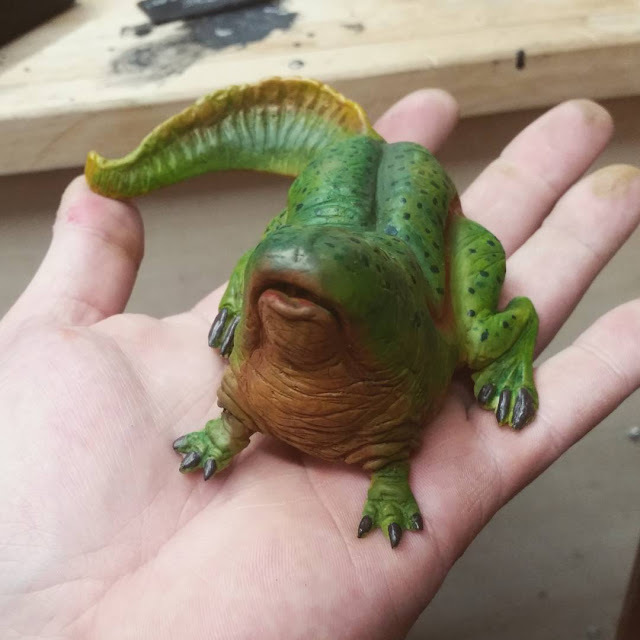 "Stranger Things" has featured some excellent creature design work. Ivana Vuksanovic returns to our pages with this nicely done stash box disguised as a traditional gothic tome, complete with chain. 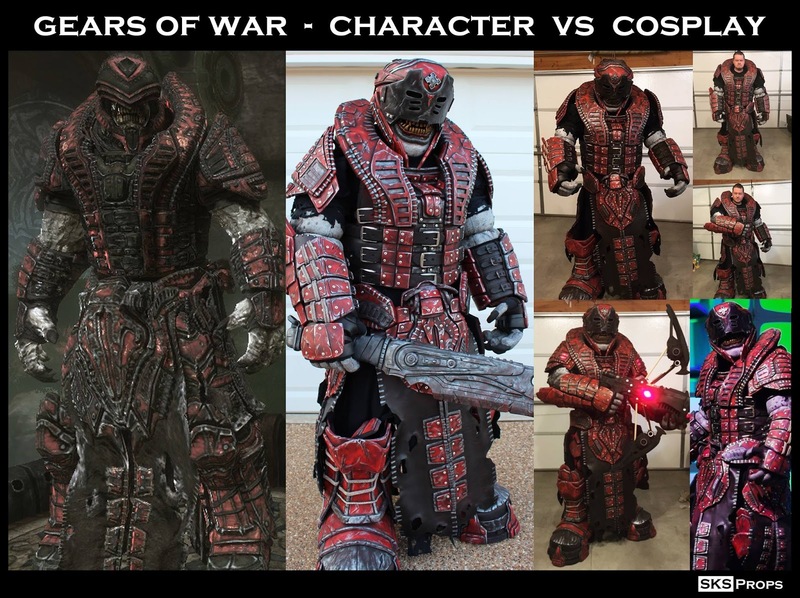 Steven K. Smith Props is responsible for this detailed recreation of the Theron Guard armor from the "Gears of War" video game franchise. Scroll down his Facebook page to check out a video of him suiting up. Here's something you don't see every day- a prop backpack. 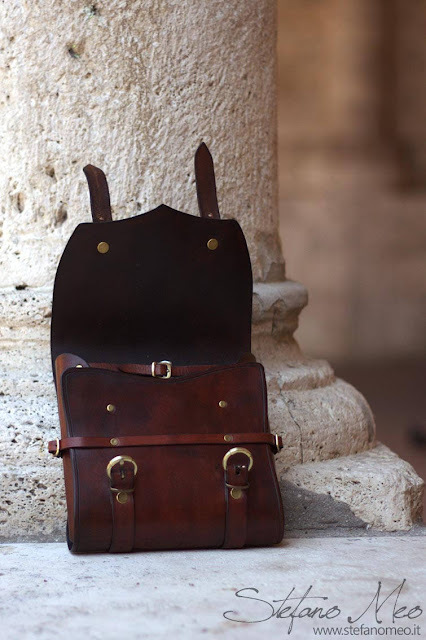 Tomàs Barceló Castelà crafted this beautiful piece along with the numerous prop items that adorn it. MilleCuirs returns to our pages with another wonderful bit of tomecraft, the Great Grimoire of Cthulhu. The tooling is phenomenally well done. As an aside, my sloppy typing revealed Google now knows the correct spelling of Cthulhu. Truly, the stars are right! 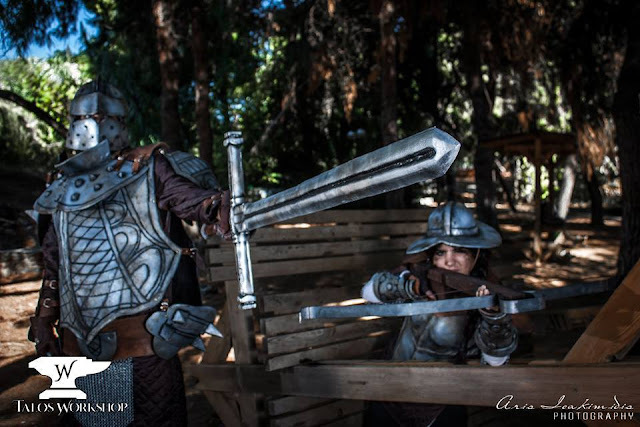 The Legend of the "Black Knight"
Head over to GNDN to check out their write up on creating a backstory for the Black Knight. No, not the mounted heavy cavalry, clanking armor kind. 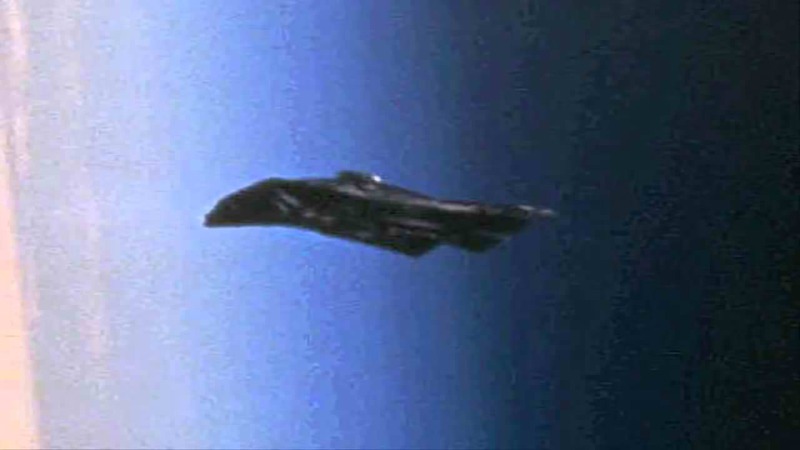 This Black Knight is an alien spacecraft that has been orbiting the Earth for thousands of years, or so a certain sub-sect of conspiracy theorists would have you believe. 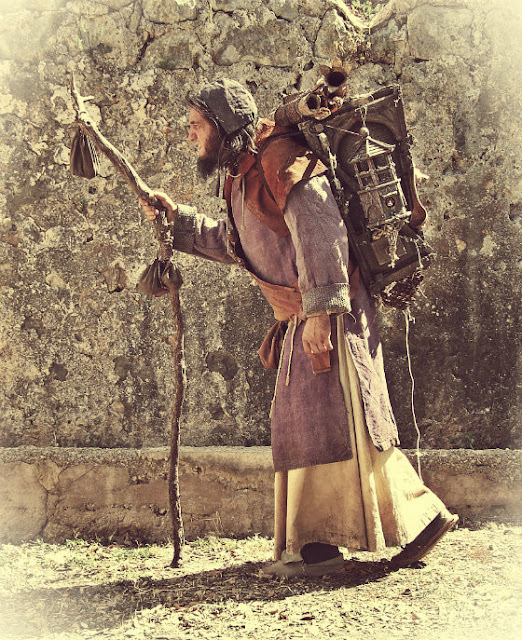 What follows is a great example of Yog-Sothery, brewing up an entire mythology based on a few hard facts and a whole lot of creative conjecture. It's an incredibly effective narrative technique that I'm surprised isn't used more often. Most of the modern Alternate Reality Games do it using faux websites to build up the game world. It's far more effective when you can take our world and make it part of the game, so to speak, by putting a believable spin on actual events. I have a post about a nifty bit of Yog-Sothery in the pipeline. Unfortunately, a small project I was peripherally involved with is taking up a large amount of my time- my grandson, who arrived early this morning. And so the accursed bloodline carries on! Heh. Update: Thank you all for the very kind words. My wonderful daughter in law is doing fine, and my son is ecstatic. I'm looking forward to changing diapers once again. More importantly, I'll be able to share more stories of changing my son's diapers back when he was a tiny little monkey boy and not the 6' 8" security manager he is now. 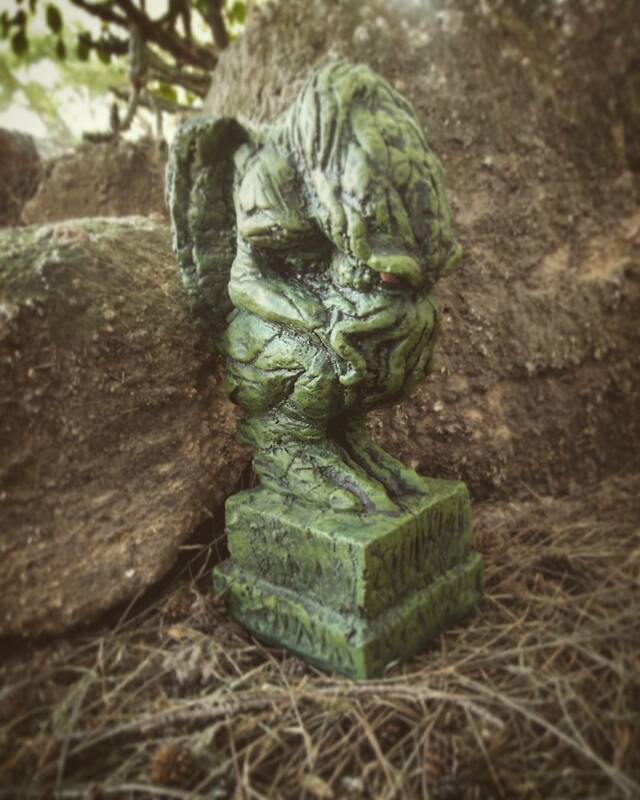 This Cthulhu idol in the wild comes to us from Abraham Cruz of InsaneGames Mexico. 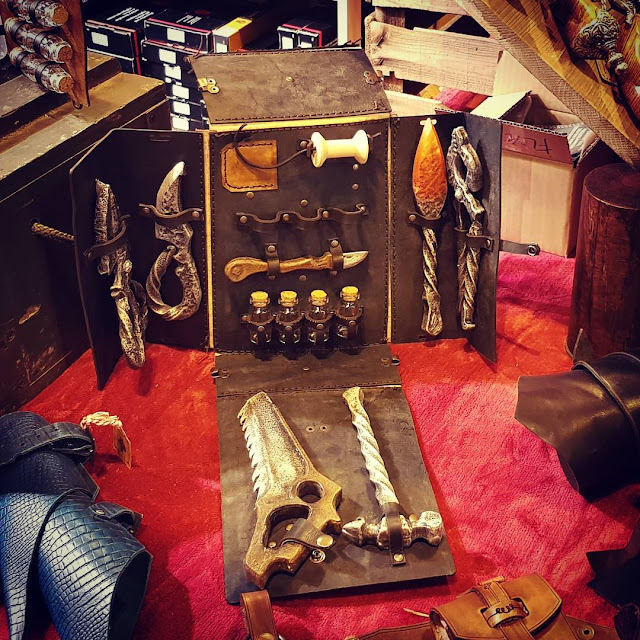 The Fakest of Fake Vampire Killing Kits Sells. Or Does It? 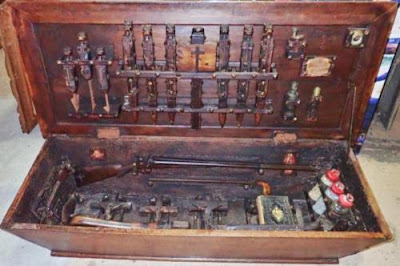 The long saga of the worlds fakest vampire killing kit entered a new era yesterday. Earlier this month I pointed out that it was once again up for sale. Yesterday it hit the auction block and sold...maybe. The item listing on Ebay is very strange. 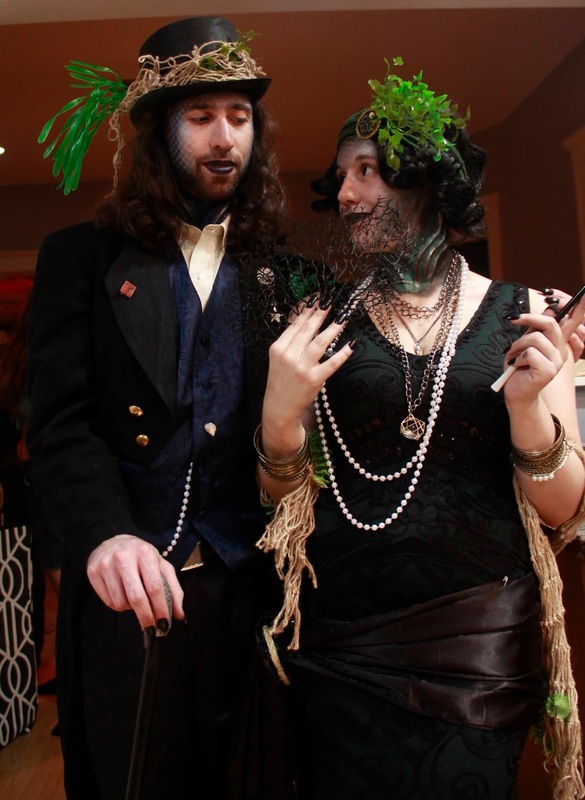 According to the bid history a single person bid twelve times and ended up winning with a final bid of $1,100. 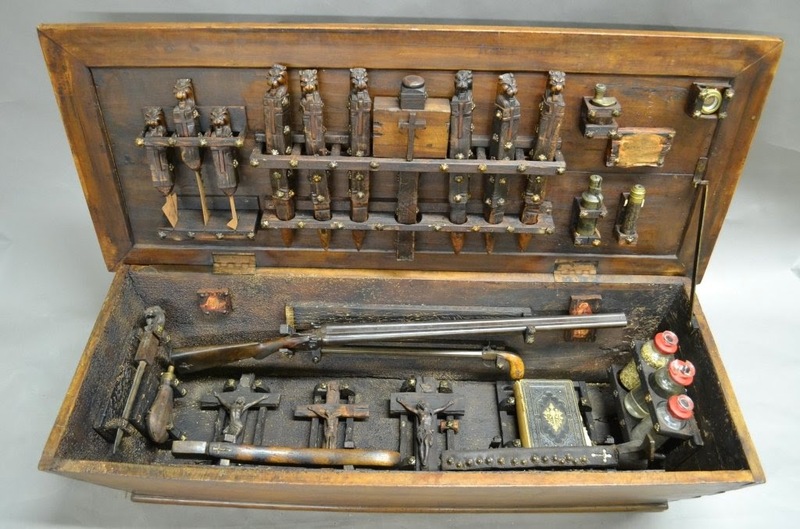 What makes that even more unusual is that Sterling Associates had another vampire killing kit up for bid at exactly the same time. This one is pretty nice, in contrast to the sloppy work on the other one. Surprisingly enough, the exact same bidder made exactly the same number of bids and won with exactly the same high bid of $1,100. The weird bid pattern may be a normal part of auctions taking bids from Ebay and a live venue at the same time. That said, I suspect we'll be seeing both of these kits again. 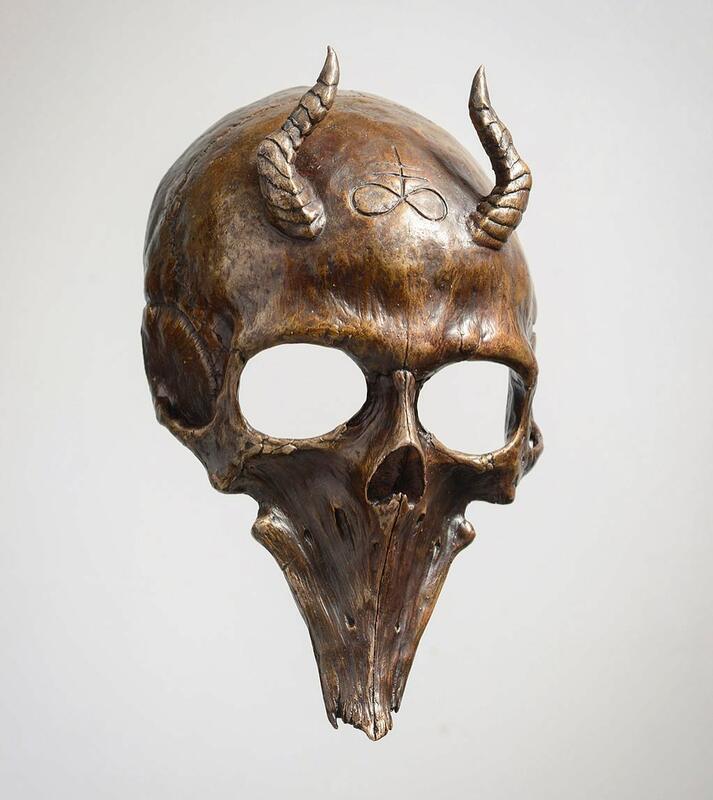 The talented Jason Soles is back with this wonderfully creepy Leviathan Cross mask, cast in bronze. 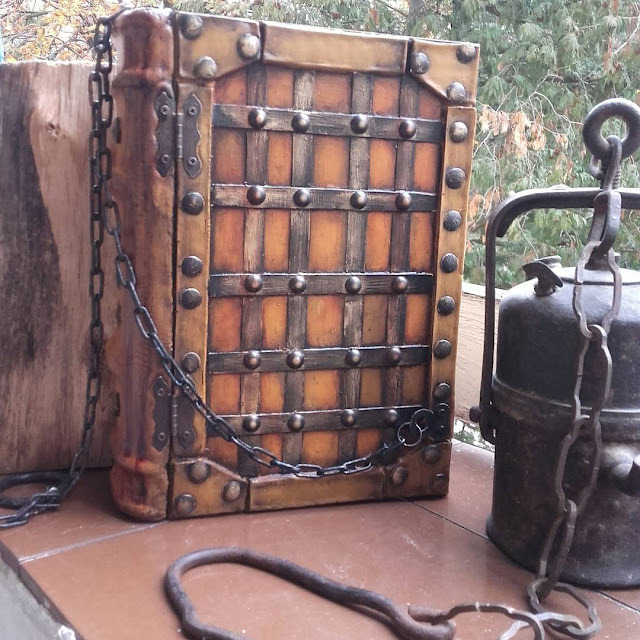 Mr. Zarono returns to our pages with this Lovecraftian prop tableaux. One can only imagine what strange ritual the skull, knife, and parchment are part of. 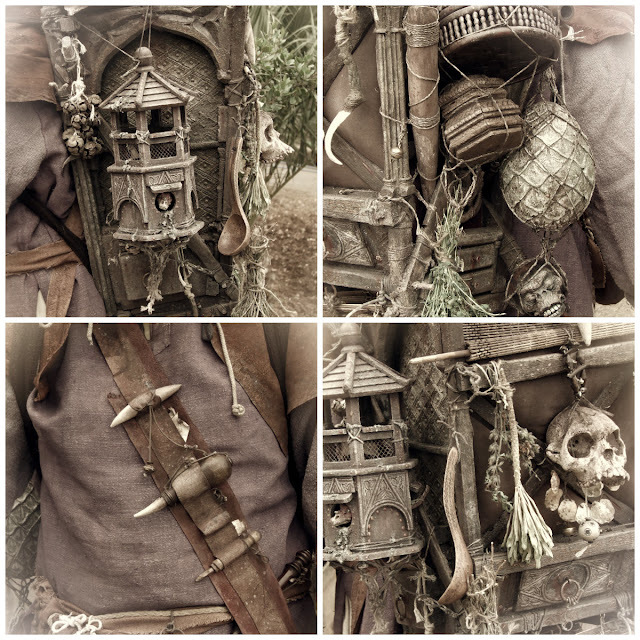 This handy LARP healer's kit comes to us from PropCorn Design Studio. - H. P. Lovecraft, "The Cats of Ulthar"
I suspect Joe Broers does not wear a horned head-dress with a curious disk detwixt the horns, but one can never be sure. 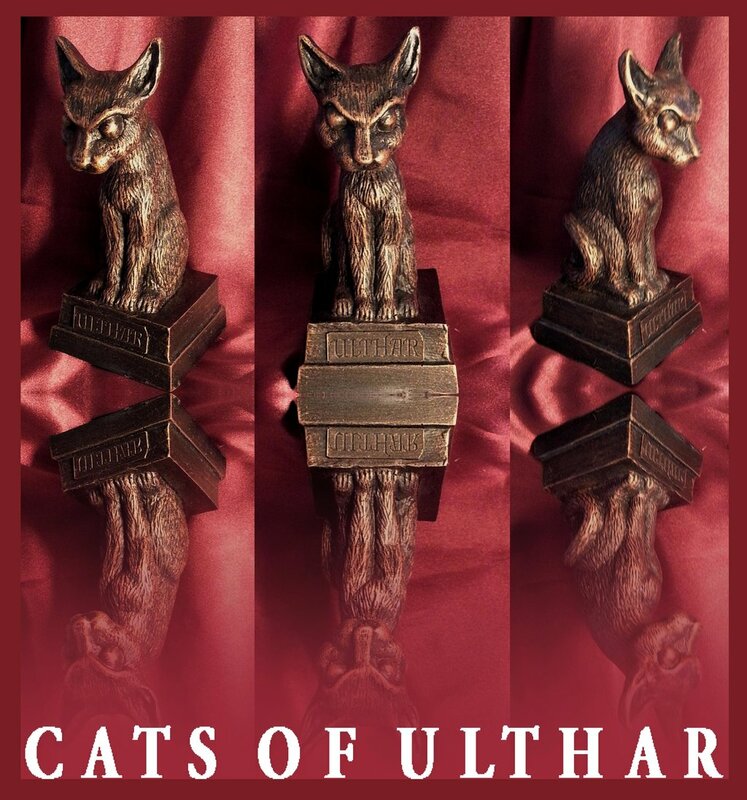 He brings us this nicely done resin figure paying homage to the titular felines of Lovecraft's story. 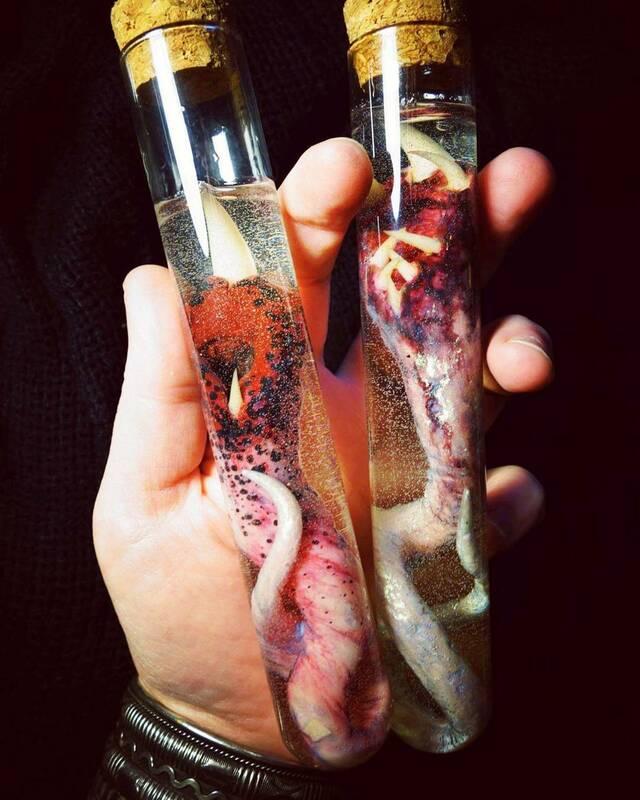 The gifted Karen Main returns to our pages with this creeptacular pair of leech specimens. 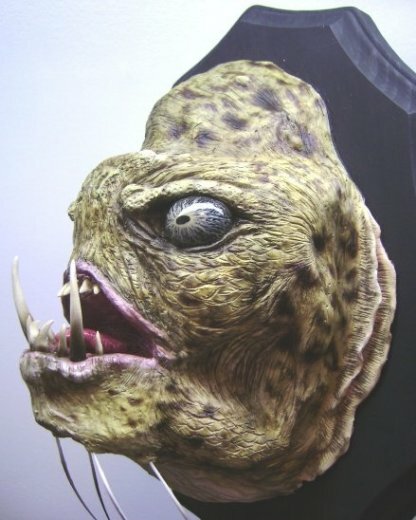 Even the denizens of Innsmouth celebrate Halloween. This stylish Deep One hybrid couple comes to us from Literally Mechanical. 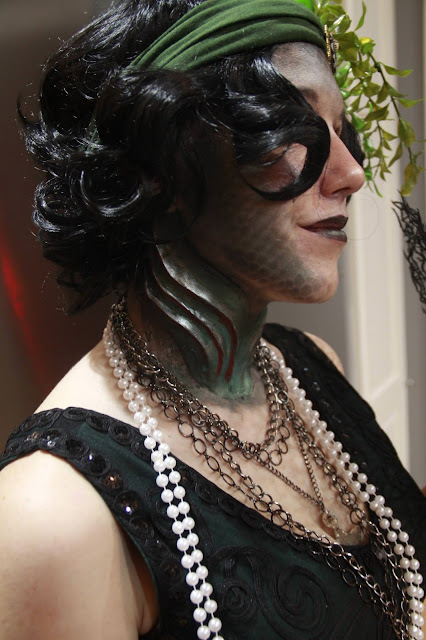 The gills were cast in silicone, while the scale makeup was applied using eyeshadow brushed on through a pair of fishnet stockings. 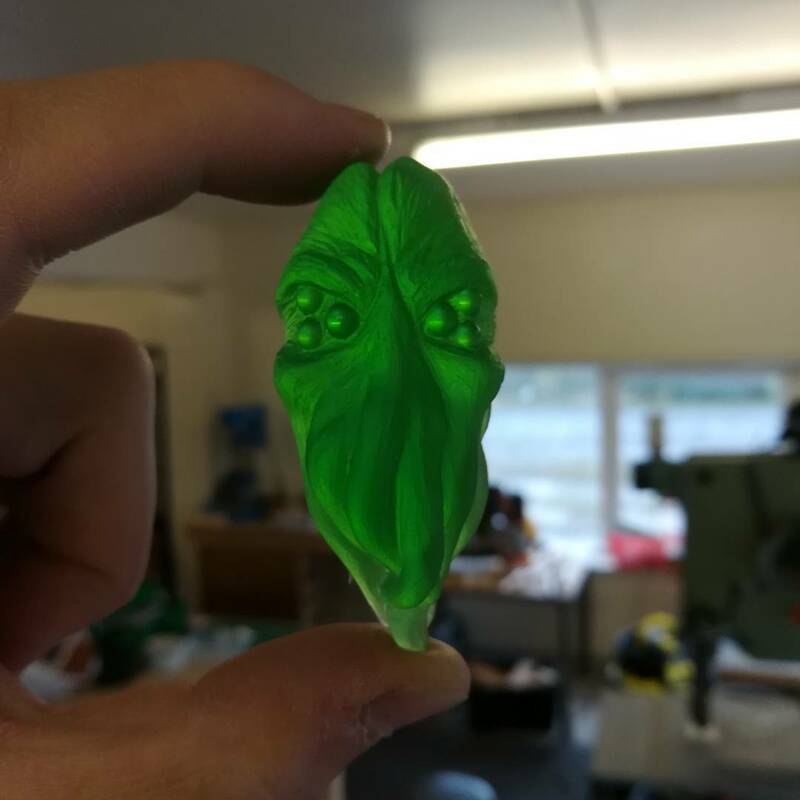 Alex White brings us this Cthulhu figure cast in clear colored resin. The flawless, bubble free appearance is thanks to the use of a pressure pot to draw off any air trapped during the initial resin pour. 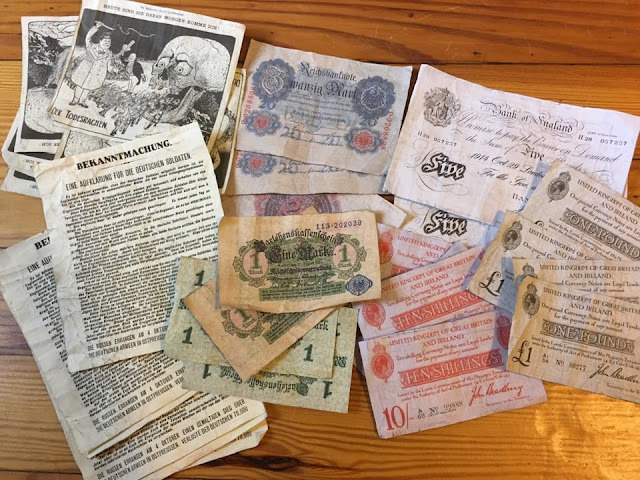 This collection of WW I era banknotes and ephemera comes to us from artist Michael R. Maranda. 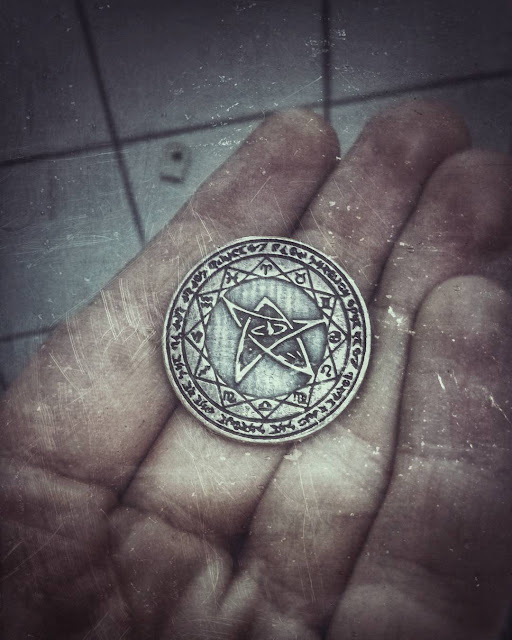 "WMN-109" brings us this nicely done Elder Sign coin. Based on the striations around the sign itself I think it was 3D printed, molded, and then cast in metal. Update: As he points out in the comments, this piece is actually based on Zero Mostel's work. 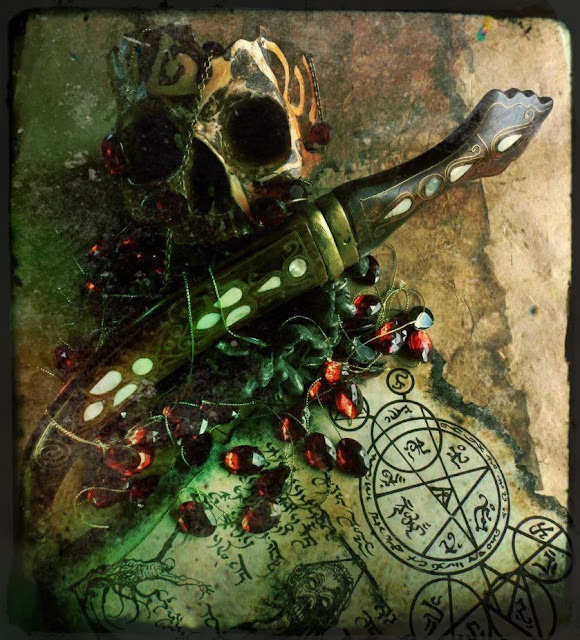 Everything other than the Elder Sign star is copied from his Summon Azathoth circle on DeviantArt. The Fakiest of Fake Vampire Hunting Kits is Back! 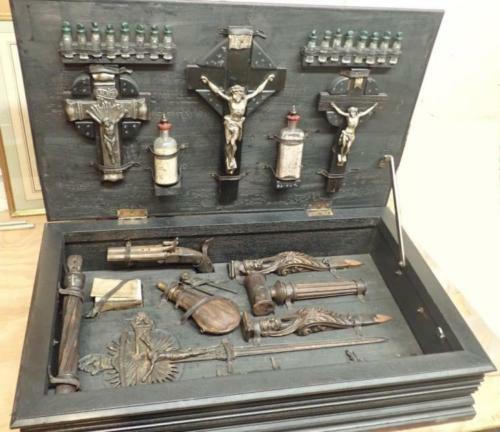 Three years ago I ragged on Sterling Associates for fronting one of the fakest vampire hunting kits ever committed to auction. Now it's back. Clearly, the original buyer wasn't happy after getting physical possession of their prize. 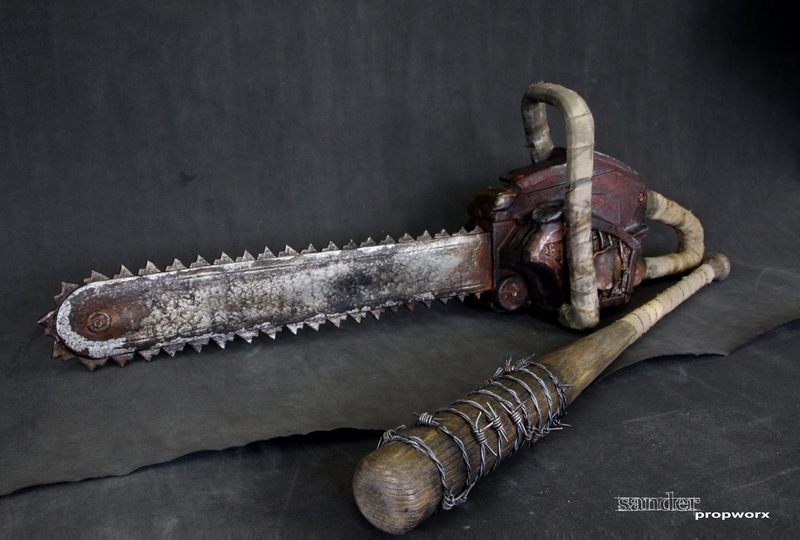 Were they upset about chair legs being passed off as "hand carved stakes"? The apparent flame-thrower that scorched the entire interior of the box without leaving a mark on the exterior? The obvious letter opener blade being used as a dagger? 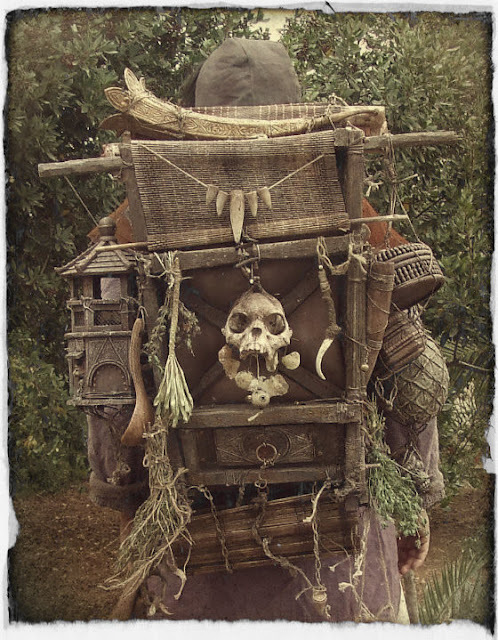 The upholstery tacks nailed into everything? STERLING ASSOCIATES STRIVES TO PROVIDE ACCURATE, OBJECTIVE, FAIR INFORMATION ON ALL LOTS. WE WILL BE HAPPY TO ANSWER ANY QUESTIONS AND PROVIDE ADDITIONAL PHOTOS. WE ADVISE THAT YOU, OR SOMEONE ON YOUR BEHALF, INSPECT ANY ITEM(S) AND COME TO YOUR OWN CONCLUSIONS BEFORE BIDDING. ALL SALES ARE FINAL. PLEASE SEE TERMS CONDITIONS. There is absolutely nothing wrong with trying to sell a vampire hunting kit. They are, quite literally, works of art. What's dishonest and unethical is trying to pass them off as actual period artifacts instead of evocative assemblage pieces. Leaving yourself wiggle room to fleece the unsuspecting and gullible is equally odious. Sweet fancy Moses, Sander Propworx really knocked it out of the park with this chainsaw and barbed-wire bat. Both weapons are LARP-safe foam with simply amazing paint finishes. Alex Libris is back with another gloriously hand-crafted leather tome. 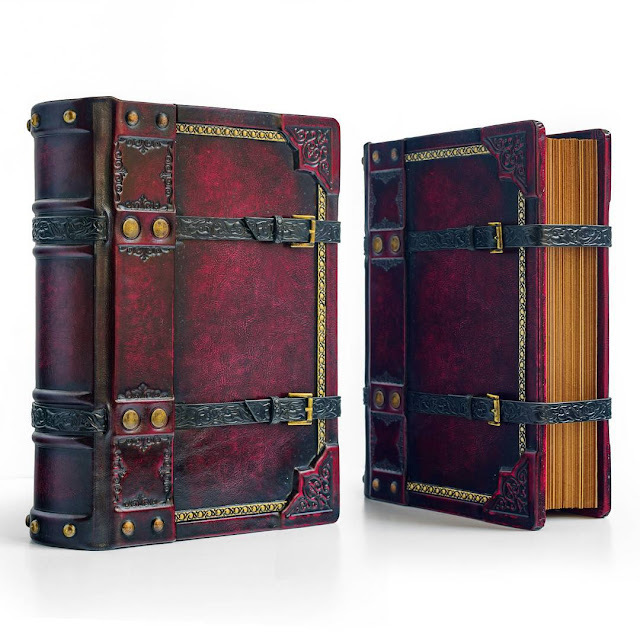 This time it's an 800 page journal featuring a tooled leather cover in crimson, brass hardware, and fitted leather bindings. Record lake salmon or barracudas mounted on the wall are a dime a dozen, but this? This delightful sea creature is a real trophy. It comes to us from master fisherman Andy.